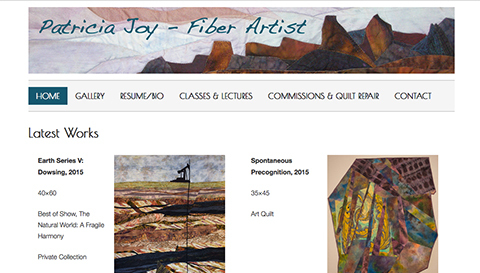 Southwest Colorado fiber artist Patricia Joy uses her beautiful, minimalist website as a gallery to display her award-winning art quilts and fiber art pieces. Patricia also offers quilt commissions and repair, quilting classes, and lectures. Her extensive resume and catalog of stunning work looks great alongside her gallery of fiber art on display in a modern, masonry-style layout. A simple back-end content management system allows her to update her website easily when new pieces are completed.